Customer service is an incredibly important part of any business, but there are plenty of companies that struggle with it, oftentimes because they can’t keep up. This is particularly true if the majority of your requests and complaints come via e-mail. Taking the time to answer each and every one can eat up a large chunk of the day, especially if you are a small business that doesn’t have the budget for someone to look after that part of customer service. One way to get around this is with the use of autoresponders, which are designed to e-mail customers when you can’t. For example, have you ever submitted a question or complain and immediately received an e-mail letting you know that your message has been received? That is an auto responder at work. 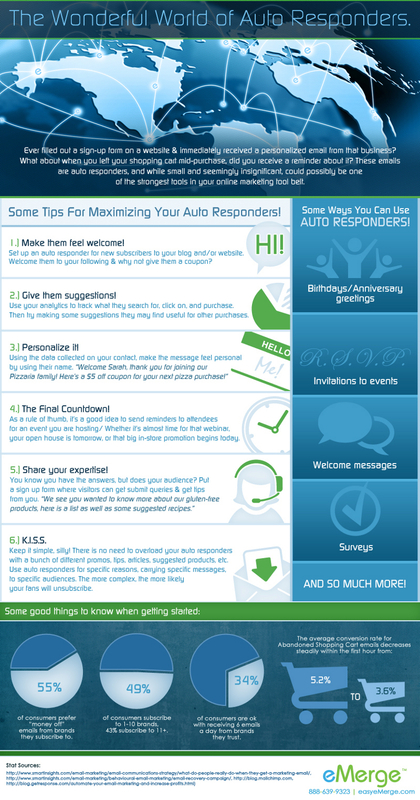 Autoresponders may sound like a no-brainer, but it’s altogether too easy to use them in a way that can hurt you rather than help. The first thing you need to take care of when using an autoresponder for marketing is letting your customers feel at home. The easiest way to do that is to have a welcome e-mail that is sent out to anyone that sign up for a newsletter or mailing list, or who makes a purchase through your site. It may not seem like much, but it can go a long way towards building a positive relationship with the customer. An autoresponder can seem very robotic of it is not personalized to the person it is being sent to. You need to configure it so that the first name of the recipient appears in the mailing, as this will make them feel as though they are actually conversing with a human on the other end of the connection. Another great marketing tip is to use analytics to customize their e-mail in a way that may make them purchase again. Pay attention to the items that they buy or search for and make recommendations based off of that information. It has been proven that people respond better to sales and events when they see there is a definite time limit. One great marketing technique is to set up your autoresponder so that e-mails are regularly sent out to remind you customers that a particular event is drawing near. They are less likely to forget about the date and time if you give them a gentle reminder every so often. The goal of marketing e-mails should be to inform, educate and entertain. Even if you are able to do that, your recipients may still be left with unanswered question. One way around that is to include a form that they can submit with any queries that they may still have. At the end of the day, the best autoresponders are those that are kept as simple as possible. Yes, you want to impress you customers with every e-mail you send, but if you overload them with information you can simply end up doing the opposite.